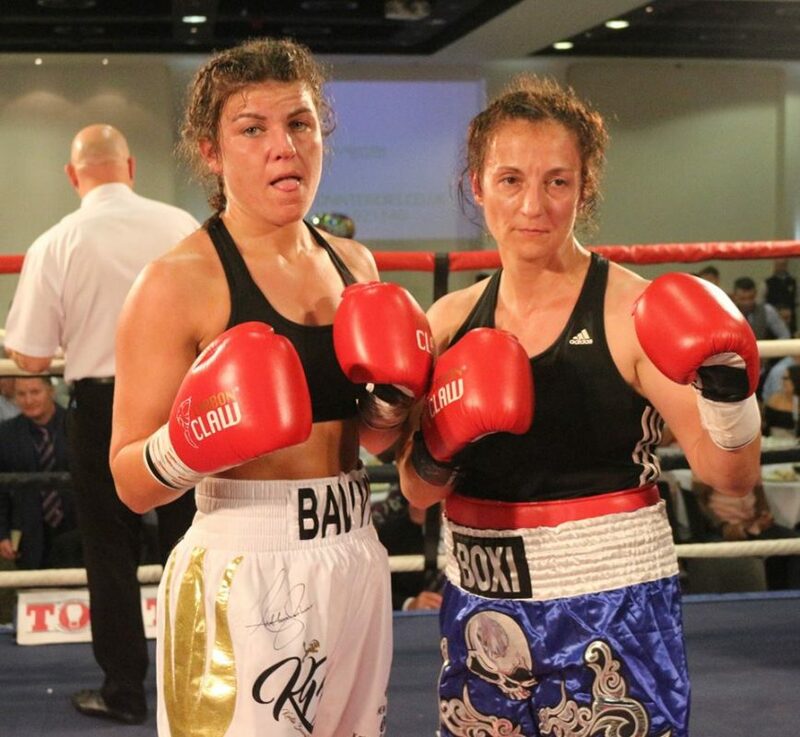 Kirstie Bavington reckons there will be a different beast at work when she resumes her pro boxing career next month. Bavington laces on the gloves and enters a paid ring for the first time in eight months at Walsall Town Hall on Saturday March 9. She is now under the tutelage of Shaun Cooper who, along with fellow former professionals Lindon Scarlett and Ray ‘Raza’ Campbell, run ‘Coops Boxing Camp’ in Brierley Hill. Recent warm weather training saw her jet off to Tenerife with stable-mate Tyler Denny, with both subsequently featuring on the March 9 bill. ‘Bavvo’ engages in her third pro contest, looking to swing her ledger into the right direction with a second paid win. She recorded a draw on her debut, where she could not be parted from Borislava Goranova in a 38-38 points decision, after four rounds. Her hand was finally raised next time out, seeing off Elaine Greenan over the distance by a round this time, 39-38 the score on that occasion. Bavington triples up in sports, working as a PE teacher in schools and playing football for the ladies team at Kidderminster Harriers outside of boxing. She said: “I’m willing to make the sacrifices needed to become a success. I was working full-time as a teacher, but I’m only doing supply work at the moment. “I’ve travelled a lot, but I’ve always kept fit while I was away. I trained when I was in Thailand and even during my trip to Vegas, which was great. “I went to Floyd Mayweather’s gym in Vegas and had a nice little session there, which was a good experience and a bit of boxing sight-seeing! “I’ve made changes and, with new coaches, I feel a thousand times better. I’ve been sparring two to three times a week, with some good fighters, and it’s helped me to improve massively. “It’s been a hard camp for this one, but quite enjoyable. I’ve been on mountain runs, track work, sprints and boxing and I’ve been taught a lot on the pads, with technique and sparring. “I’m looking to be stronger in my next fight, pick shots better, move my head better and just go at my opponent for four rounds, There will be no excuses. “I’ve learned how to try and control my nerves, get mentally prepared and believe in myself. The fitness and skill is there. I just need to display that on the night. “I’ve got a new style, stronger and technically better. I can’t wait to get back in there. I’m confident I can be a success, if I can stay active. The Midlands super lightweight crown will be contested at the top of the Town Hall bill, with champion Connor Parker defending against Cori Gibbs. Parker and Gibbs have an added incentive past area honours, too, with the bout approved as an eliminator to Robbie Davies Jr’s British title. Former British middleweight champion Tommy Langford is chief support for the top liner, as he moves up to super middleweight. The Devon-born Brummie, 29, staged two fantastic slugfests with Jason Welborn for the Lonsdale belt last year. The undefeated hopeful next steps into a pro ring for the 20th time, with 19 victories and no defeats. He competes at the Town Hall on February 16 and March 9. Reigning Midlands middleweight ruler and English title challenger Tyler Denny, from Rowley Regis, is scheduled for his 14th outing as a pro. Talented welterweight Tommy Ghent, from Coseley, has racked up eight victories (three TKOs) without reply but hasn’t boxed in nearly a year. Wolverhampton’s Conah Walker, a protege of the legendary Ricky Hatton, has a hat-trick of paid successes. The Merridale Boxing Club graduate turned over last September. A fourth win will also be the target of Burntwood’s Troi Coleman. ‘The Hawk,’ a former kickboxer, has three points verdicts under his belt so far. Lightweight prospect Connor Lee Jones, of Brierley Hill, appears for the third time as a pro with two wins under his belt, both over the distance.